Hemyock makes a good centre whatever the weather. The wide variety of facilities both locally and within easy travelling distance can satisfy a wide variety of interests. There are four comfortable cottages in the castle grounds and alongside St. Margaret&apos;s Brook, available for let unfurnished. Each cottage has been carefully converted and modernized, preserving its original character. 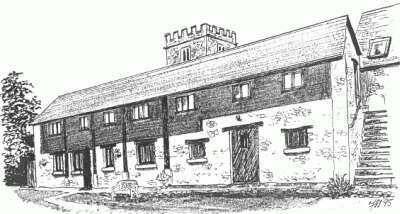 The cottages are called: "Mow Barton" "Oliver&apos;s Bay" "Sir William" and "Lady Margaret." Guard Houses: Sir William and Lady Margaret. The remains of the Medieval Castle built in 1380 by Sir William and Lady Margaret Asthorpe, surround the even older fortified Manor House. (Until recently a farm house.) Parts of the massive gate house, towers, walls, and moat still remain. Much has been done to stabilise the remains, research the history and improve access to visitors. Efforts continue. The grounds are occasionally open to the public. 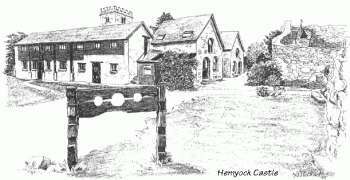 Hemyock, in the upper Culm Valley, is situated in the Blackdown Hills, an area of outstanding natural beauty long popular with artists and writers. 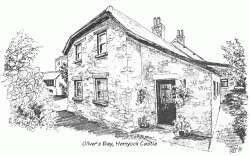 This is a good centre for day tours to Exmoor, Dartmoor, and both the North and South Coasts. There are also many nearby places of interest. There are excellent shopping facilities at the Cathedral City of Exeter (25 miles), Taunton, Honiton, Tiverton (11 miles and all with traditional Markets). Honiton is popular for its antique shops. Wellington (5 miles) also has a good indoor Sports Centre. Walking and horse riding (5 miles) are available nearby. Hemyock has 2 good shops supplying day to day needs, The Catherine Wheel public house has a restaurant, and a Cafe provides a take-away food service. Other local restaurants include a popular one in nearby Culmstock. The whole site is enclosed by substantial walls, fences and gates. Trees and shrubs give added tranquility and privacy. Local attractions and day trips from Hemyock. Artists and writers in the Blackdowns. The wide variety of cultural, entertainment and sports facilities within easy travelling distance include popular surfing beaches. When the Summer crowds have gone, there is more room for sports such as kite surfing. Local firms can supply all special equipment and training. There are four comfortable, all-electric, unfurnished cottages. Each cottage has been carefully converted and modernized, preserving its original character and charm. Free parking is provided for one or two cars per property. Mow Barton was carefully converted from a traditional open linhay and stable block to provide comfortable family accommodation. Exposed beams, woodwork and wall lights add to the charm. The ground floor is also suitable for wheel chair access (Category 3 Access Certificate granted), including a downstairs shower-room with toilet, shower cubicle and large wash basin. The lounge has a feature fireplace with electric fire. The modern family kitchen has a dining area. Upstairs, there are 3 bedrooms; a double, a twin, and a single bedded room. The bathroom has a shower over the bath, toilet, and an airing cupboard. Outside, there is a barbecue, and a small private sitting area overlooking a large level grassed area. Walnut and other trees provide shady spots. 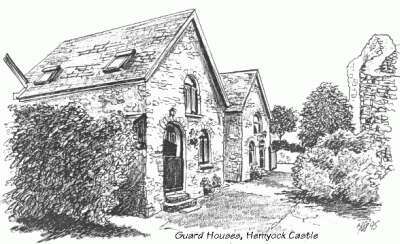 Sir William and Lady Margaret are two detached guard houses named after the founders of the castle; once, they guarded the outer side of the moat and draw-bridge. The compact, comfortable, well modernized accommodation in each cottage consists of one double and one twin bedroom, bathroom with electric shower over the bath, and airing cupboard, upstairs. Downstairs, each has a living room with modern corner kitchen. Oliver&apos;s Bay is a spacious self-contained ground floor apartment with its own private entrance. It has a lovely large lounge with beamed ceiling and inglenook, one double and one twin bedroom. The modern kitchen has a dining area. The bathroom has a shower over the bath, and airing cupboard. The WC is separate. There are night storage heaters and electric fires. There is a small private garden with washing line and garden furniture. Route from the M5 Motorway. At present, the cottages are usually let unfurnished, for longer terms.